Laparoscopy provides excellent exposure of the distal esophagus, thus is an ideal approach for most epiphrenic diverticula. This study reviews our outcomes to support this statement, which is the largest laparoscopic series to date. Methods: From 1997 to 2008, we operated on 23 patients for epiphrenic diverticula. Of these, 18 had laparoscopic diverticulectomy, myotomy, and fundoplication (1 had a gastric bypass), while 5 had thoracotomy (22%) and diverticulectomy due to severe adhesions from previous abdominal surgery or morbid obesity. Results: Median age was 57 years (range, 23-83 years-old). Eigthteen patients had manometry in our institution preoperatively. 12 patients (66.67%) had esophageal dysmotility and 2 others an associated Leiomyoma. The size of diverticula ranged from 2 to 10cm (median 4cm). The laparoscopic group had a shorter length of stay (median = 3 days) than the open thoracotomy group (median = 7 days). Complications occurred in 3 patients (16%) laparoscopy group and 3 patients in the thoracotomy group (60%). Early on we approached larger more proximal diverticula via thoracotomy. The most recent case was a 9 cm diverticulum extending 12 cm above the GEJ which was resected laparoscopically. Since 2005 we have performed nine consecutive cases laparoscopically. Sixteen patients answered the follow-up survey at a median post-operative time of 34 months (range 1-138). Dysphagia improved in 15 (94%), nausea and vomiting in 12 (75%) and regurgitation in 11 (69%). Fourteen (88%) patients rated the operation as good or excellent. None of the patients developed a recurrent diverticulum. 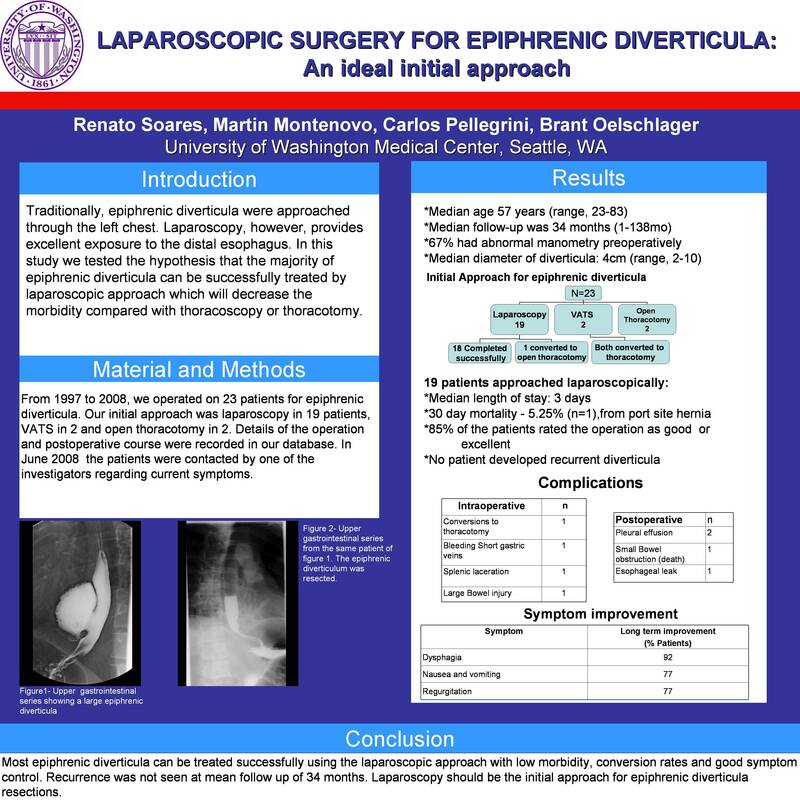 Conclusions: Laparoscopy is a safe, feasible, and effective approach for epiphrenic diverticula, and probably should be the method by which most are resected.